It’s that time of year again! It always seems to creep up on us, doesn’t it? This traveler’s gift guide is my largest one yet, so get that holiday shopping list ready and cross off all those travelers on your list. And maybe treat yourself while you’re at it! If you don’t find the perfect gift here, you can always check out the 2016 gift guide or the 2017 gift guide for more inspiration. Searching for a socially conscious gift this holiday season? Check out my guide for travel gifts that give back! I really like hard copy books. But I am officially a Kindle convert. There is a time and a place for the hard copy book, but traveling isn’t one of them. Especially for longer trips where it’s likely you may finish more than one book, having a Kindle Paperwhite E-reader saves you the trouble of having to carry around multiple books. Even for shorter trips, I love not having to fit a big book in my purse when I can just slip in my small kindle. Plus, the battery on these things seem to last forever, so you don’t have to worry about it dying quickly. It’s like my living room was just waiting for Push Pin Travel Maps to come along because it knew that map would be the perfect focal piece. Even if you have seen other push pin maps in the market, I doubt they could compare to this one in particular. Push Pin Travel Maps are beautifully crafted and arrive with a hanging kit already installed. The personalization options seem to be endless, as you can pick from different map styles, pin colors, frames, and even customize the map with your name and a quote of your choosing. My favorite part is the pin legend, which you can also personalize, with categories such as Past Travels, Future Travels, and Bucket List like I chose. To top it all off, the map makes for one of the best conversation starters when guests are over! Read my full review for more details on why every traveler needs a Push Pin Travel Map. For travel inspiration while drinking wine, these stemless wine glasses are a win. They have a whole bunch of other designs as well if you’re looking for another variation. Though I can’t guarantee this combination won’t make you spontaneously book your next flight! Leave it to DELSEY to create the perfect carry-on bag! It has four double spinner wheels for extreme ease of navigation through the airport, and it comes with a clear TSA-friendly bag for your liquids. For safety, the bag has a built-in TSA-accepted lock. My favorite part of the DELSEY Montmarte Carry On Suitcase is that it’s expandable up to two inches. I almost always return home with more in my suitcase than when I left, so this comes in handy pretty frequently! The slim and sleek DELSEY MONTMARTRE+ Personal Tote bag. This versatile laptop bag is one of the best travel companions. It slides easily over the handle of your luggage so your shoulder isn’t sore by the time to get to the gate. Plus, if you’re heading on a business trip or just need a more professional looking bag, the DELSEY MONTMARTRE+ Personal Tote is the perfect solution. Read my full review for more fab features of this tote. This marks the third year in a row an Airportag product has made the list. But seriously, how can you ever get enough of airport-themed travel gear? These Airportag packing bags are a quirky and fun way to carry any kinds of small items and stay organized. Chargers, makeup, underwear, snacks, toiletries, tiny souvenirs… you name it! Remember to check out all of their other cool products too. 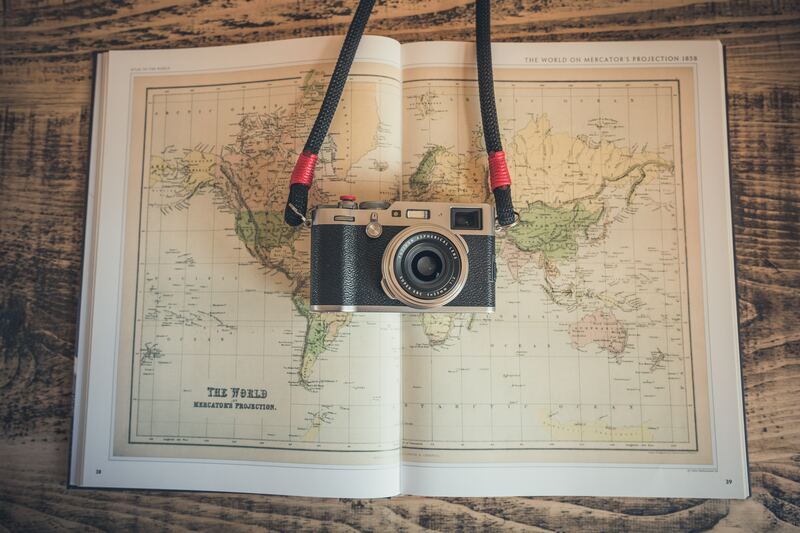 They have some of the most unique gifts you can give to the travel lover in your life! BONUS: Use the code LITTLE-THINGS at checkout to receive 10% off your order! If you’re searching for a unique and memorable gift, the art prints by Mel Smith Designs are the ideal solution. She creates illustrations and patterns inspired by the cities and countries she has visited, and translates them onto homewares and gifts. She offers all kinds of items, like coasters, map prints, postcards, tea towels, and more. She also provides a bespoke illustration service where you can request a custom print or gift. Some ideas she suggests? Highlighting the route of a backpacking adventure, drawing your favorite local pub, illustrating a beautiful scene from your honeymoon, or just about anything else you can think of. I primarily use this toiletries travel bag for longer trips since I don’t really use that many toiletries to begin with. But I love the different compartments in this bag to keep all your toiletries organized, and the best part is that there is a hook so you can easily hang the bag. Especially for smaller bathrooms, this can free up a lot of space while you’re getting ready. I love every time I look at the map on my laptop. There are all kinds of different world map laptop cases depending on what type and size of computer you have. My MacBook case gets me excited every time I see that colorful map staring back at me. I don’t travel anywhere without my packing cubes. Regardless of how long I’m traveling for or how light I’m packing, they always keep everything so much more organized. It’s also a great way to separate your clean clothes from your dirty clothes. I recommend mixing up the sizes you get so you can arrange your clothes in a way that fits best for each bag and trip. If I could wear these pants every day, I would. They are the most comfortable pants you will ever wear. They are one-size fits all, so I understand if you are skeptical (I was too). I have especially short legs, but thankfully they have an elastic band at the bottom so they never drag beneath my feet. This also means I can pull them up into capris if it’s hot outside. As for the waist, even if you overstuff yourself, these harem pants will adjust with you! For those times when we aren’t traveling, this compass necklace is the perfect inspiration for that next trip. It’s also a meaningful gift that will last for years to come. It makes for a great milestone gift as well, like graduation or a special birthday. This bag is one of my favorite finds. I had been looking for the perfect travel bag for months, just like this one. When traveling, many times you end up out on the town for the entire day. Because of that, I like to have a bag that is big enough to hold a sweater in case it gets chilly, my camera, and have a bit of extra space in case I end up buying something. But I try to avoid carrying a backpack around since it can be bulky and for safety reasons I prefer to have a bag that I can keep in front of me — plus it gives my quicker access to my camera. This canvas crossbody messenger bag meets all of my requirements! This was an $18.99 well spent, as six months later I am still using this bag on a daily basis and it is going strong. My favorite thing about this travel adaptor is the two USB ports it has in the side. That means you could charge three devices at the same time with this one adaptor! I take this adaptor with me on every international trip, just make sure to check that it is compatible with your destination as some remote countries might have a unique outlet. The newest soy candle collection from Oojra includes this travel candle gift set, that is environmentally friendly and will help you relax after a long day of business travel or being out on the town. Each candle has its own fragrance inspired by different destinations around the world. This little gadget will be your best friend on those long road trips. Keep all your devices powered up with this 4 USB Car Charger. You’ll be able to charge up at the same time as your travel companions so there are no arguments about who needs a charge the most. Searching for a simple but useful stocking stuffer? I always carry my clothes line with me wherever I travel. You never know when it may come in handy. Most commonly, it makes it easier to hang your clothes to dry when you’re washing them on the road. I’ve also used it for shorter trips to hang my bathing suit to dry when there’s not a better place to hang it. Two years later and I am still obsessed with my Sony a6000 Mirrorless Camera. It is absolutely possible to take good quality photos without having to lug a big, heavy camera around while you’re traveling. This guy fits right in my purse and I no longer travel anywhere without it. For the light packers or outdoor enthusiasts, the Scrubba Wash Bag is a lifesaver. It’s basically a mini on-the-go washing machine that you can pack in your backpack. Just make sure you have some laundry detergent with you, add the water, and scrub away! The internal nodules create the old-school washboard effect of scrubbing your clothes. It’s perfect for any kind of trip where you’re packing light and don’t have access to a washing machine. I used mine on a regular basis when I was backpacking through Nepal! Last but not least, my favorite reads from 2017. The books that topped my list this year are Born a Crime: Stories From a South African Childhood by Trevor Noah, Yes Please by Amy Poehler, Behold the Dreamers by Imbolo Mbue, and Start Something That Matters by Blake Mycoskie.